Type represents the kind of value and determines how the value can be used. 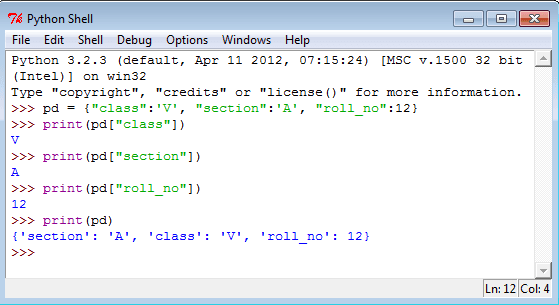 All data values in Python are encapsulated in relevant object classes. 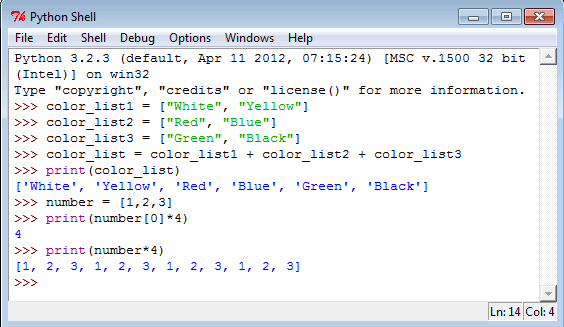 Everything in Python is an object and every object has an identity, a type, and a value. 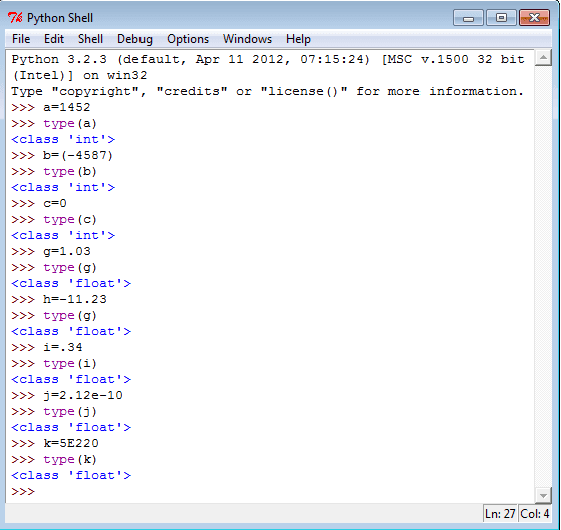 Like another object-oriented language such as Java or C++, there are several data types which are built into Python. Extension modules which are written in C, Java, or other languages can define additional types. Numbers are created by numeric literals. Numeric objects are immutable, which means when an object is created its value cannot be changed. 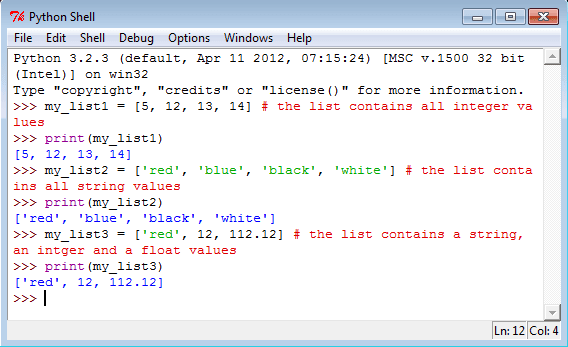 Python has three distinct numeric types: integers, floating point numbers, and complex numbers. Integers represent negative and positive integers without fractional parts whereas floating point numbers represents negative and positive numbers with fractional parts. In addition, Booleans are a subtype of plain integers. 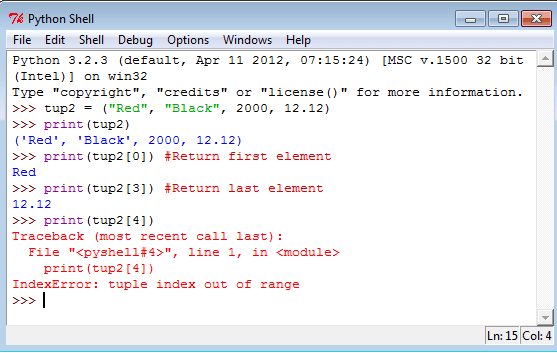 See the following statements in Python shell. Mathematically, a complex number (generally used in engineering) is a number of the form A+Bi where i is the imaginary number. Complex numbers have a real and imaginary part. Python supports complex numbers either by specifying the number in (real + imagJ) or (real + imagj) form or using a built-in method complex(x, y). 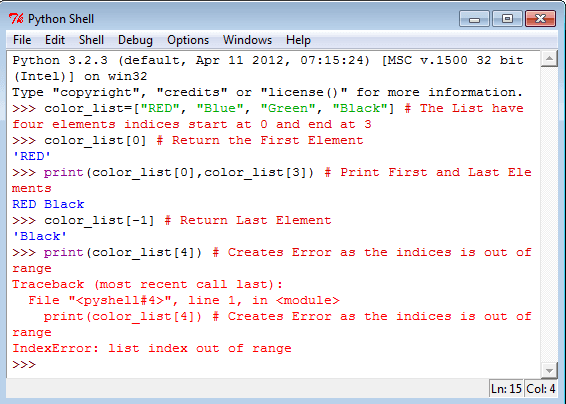 See the following statements in Python Shell. The simplest build-in type in Python is the bool type, it represents the truth values False and True. 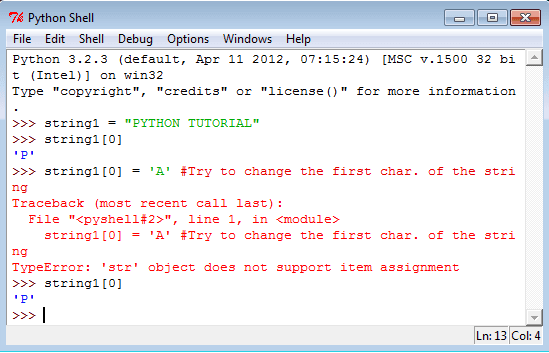 See the following statements in Python shell. 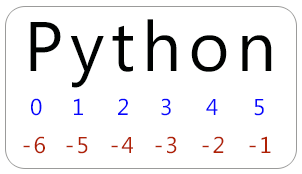 In Python, a string type object is a sequence (left-to- right order) of characters. 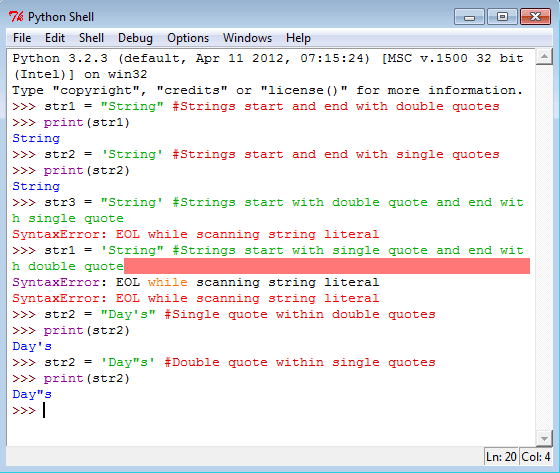 Strings start and end with single or double quotes Python strings are immutable. 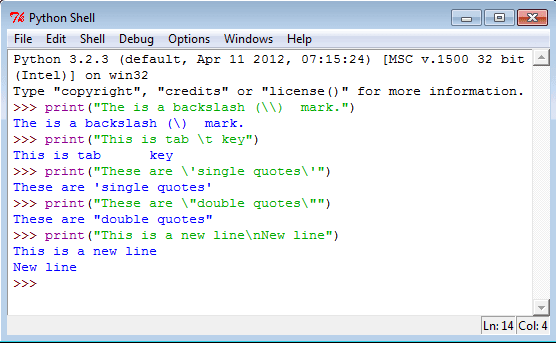 Single and double quoted strings are same and you can use a single quote within a string when it is surrounded by double quote and vice versa. Declaring a string is simple, see the following statements. The backslash (\) character is used to introduce a special character. See the following table. See the following statements on special characters. 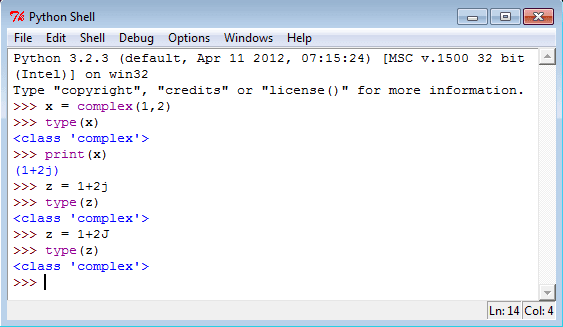 Strings are arrays of characters and elements of an array can be accessed using indexing. Indices start with 0 from left side and -1 when starting from right side. 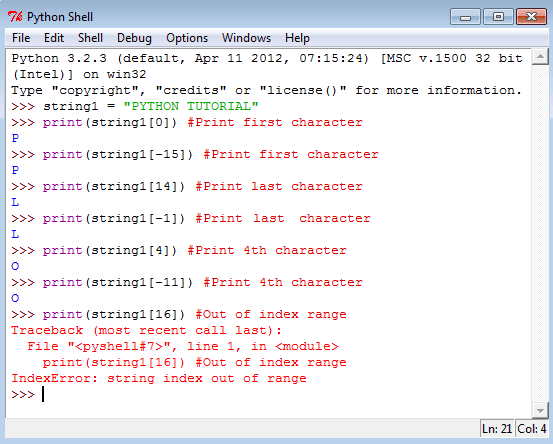 See the following statements to access single character from various positions. Strings are immutable character sets. 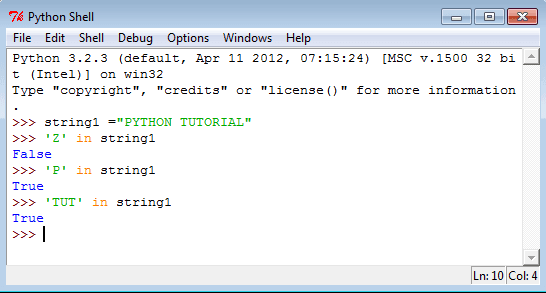 Once a string is generated, you can not change any character within the string. See the following statements. 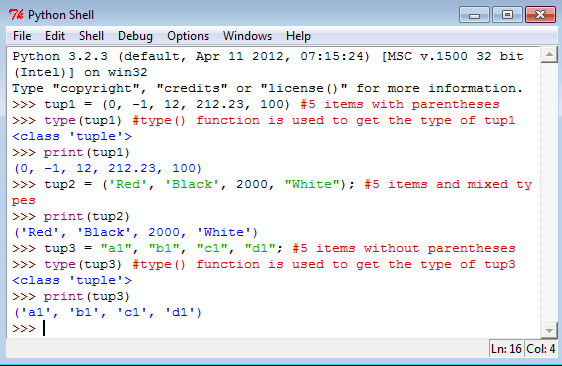 The 'in' operator is used to check whether a character or a substring is present in a string or not. The expression returns a Boolean value. See the following statements. To cut a substring from a string is called string slicing. 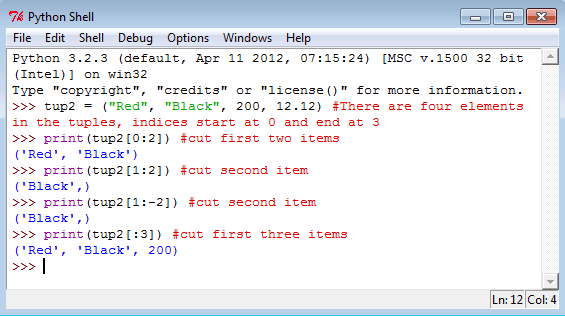 Here two indices are used separated by a colon (:). A slice 3:7 means indices characters of 3rd, 4th, 5th and 6th positions. The second integer index i.e. 7 is not included. You can use negative indices for slicing. See the following statements. A tuple is a container which holds a series of comma-separated values (items or elements) between parentheses. Tuples are immutable (i.e. you cannot change its content once created) and can hold mix data types. To create an empty tuple or create a tuple with single element use the following commands. Elements of a tuple are indexed like other sequences. The tuple indices start at 0. See the following statements. 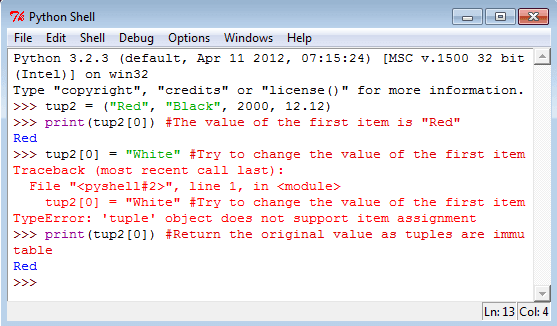 Tuples are immutable which means it's items values are unchangeable. See the following statements. 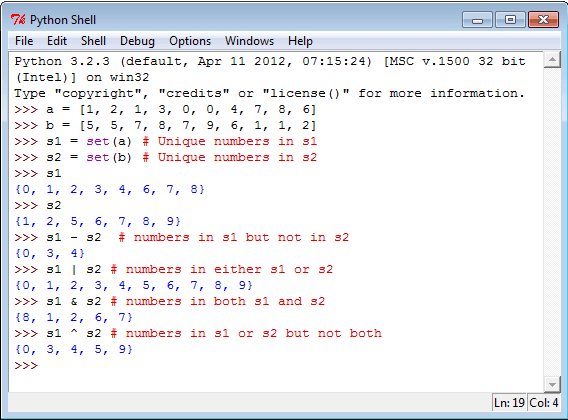 Like other sequences like strings, tuples can be sliced. Slicing a tuple creates a new tuple but it does not change the original tuple. Use + operator to create a new tuple that is a concatenation of tuples and use * operator to repeat a tuple. See the following statements. 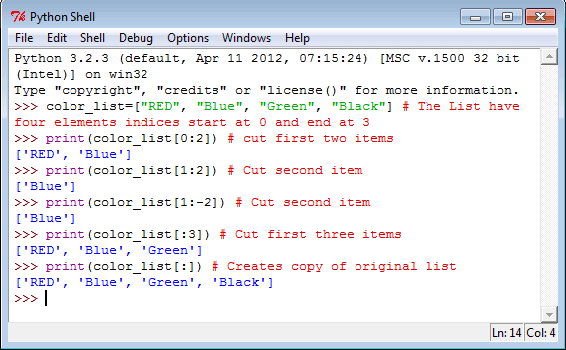 This refers to the items of a list starting at index startIndex and stopping just before index endIndex. 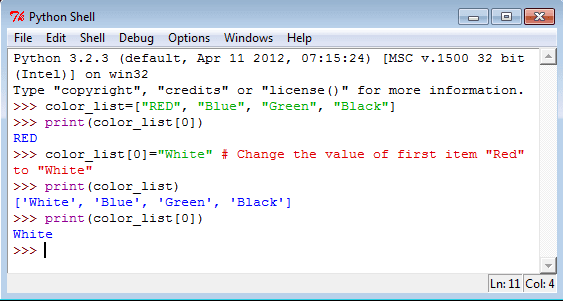 The default values for list are 0 (startIndex) and the end (endIndex) of the list. If you omit both indices, the slice makes a copy of the original list. See the following statements. A set is an unordered collection of unique elements. Basic uses include dealing with set theory (which support mathematical operations like union, intersection, difference, and symmetric difference) or eliminating duplicate entries. See the following statements. This type has a single value. There is a single object with this value. This object is accessed through the built-in name None. It is used to signify the absence of a value in many situations, e.g., it is returned from functions that don't explicitly return anything. Its truth value is false.